On a first-time trip to Sydney, BTN’s Richard Cawthorne basks in a long weekend in one of the world’s most exuberant cities. When it’s not having to cope with disastrous floods, as last week, Sydney is an undeniably exciting city to explore, embraced by one of the world’s best-known harbours – and best-known views – and nearly always bathed in bright sunshine if you choose the right time to go. The heart of it is Circular Quay, where visitors can stand looking out to sea with the Sydney Harbour Bridge on the left and the equally-renowned Sydney Opera House on the right. Thanks to those two monuments, it’s one of the major places to be if you want to be on the water – the other is Darling Harbour – and the crowds prove it. The footpaths along the water are lined with bars, cafés, restaurants and boutiques, and thronged with people. Ferry terminals for trips across the harbour are there, and the local station for Sydney’s light-rail system, whose network links the various neighbourhoods and which, crucially, connects the central business district with the airport, providing a quick and inexpensive ride from plane to hotel. This was a private visit, fitted in over a long weekend while I was on a trip to Western Australia, which seasoned travellers will recognise instantly is on the other side of the continent. It sounds daunting, but it’s only a 4hr flight by Virgin Australia and smooth service and an excellent entertainment system (I saw The Martian and Bridge of Spies, not to mention the latest Star Wars on the way back) helps the time to pass quickly. Pre-trip research via Google and elsewhere revealed a host of tempting places to stay. As a first-timer, I was looking for something on the harbour itself and up popped the, and I quote, ‘Sydney Harbour Marriott Hotel at Circular Quay’, which said it all really. I specified a bridge-view room, and 2718 filled the bill with the extra advantage that it also overlooked the berth where the big liners come in. If I needed confirmation of the popularity of cruising, this was it – in four days, I saw four big ships: Royal Caribbean’s Voyager of the Seas and Explorer of the Seas, Crystal Legend and Cunard’s Queen Victoria. The hotel was also only a 5min walk from the quay itself and 10min from the bridge or the opera house. My usual habit when I’m anywhere new and the service is available is to take one of the hop-on, hop-off sightseeing bus tours. Sydney has the Sydney and Bondi Explorer, which is actually two itineraries, one taking in the city and the other the beaches and bays. One ticket is valid for 24hr on both, and full commentary is provided. There are a total of 34 stops and buses run every 15-20min for the Sydney service and every 30min for the beaches and bays. In the city, the tour takes in Darling Harbour, the area beneath the bridge known as the Rocks, Chinatown, Circular Quay, the Opera House, Botanical Gardens, Hyde Park, Kings Cross and Woolloomooloo. The Bondi and Bays Explorer tour stops include Paddington, Bondi Beach, Rose Bay and Double Bay. I did both tours, hopping on and off and absorbing all the sights and sounds of a (to me) new city. Now much cleaned up after a raffish past, Kings Cross on the city itinerary was worth a second visit for its shops and cafés, which I did the day after the bus tour, though the friendly advice of the tour guide was not to venture there after dark on a party night. The rich suburbs around the bays with their million-dollar-plus homes, some put in danger by last week’s storms, provided another interesting view of the city, while Bondi Beach (the name is from an Aboriginal word meaning ‘the place of breaking water’) is well worth the trip to see its huge expanse of sand and, of course, the waves. Another highlight worth mentioning, though not part of the bus tour, was the ferry trip across the harbour to Taronga Zoo, which offers a view of the city from the opposite side of the quay. 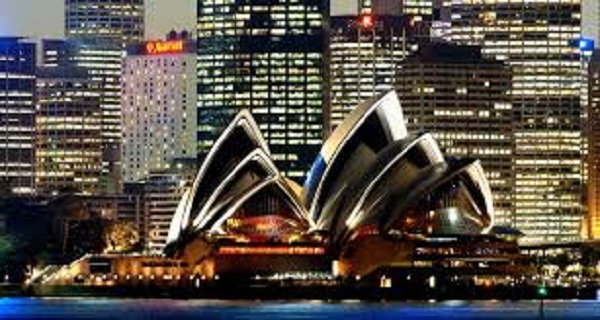 Business travellers visiting Sydney have a wide choice of hotels within close range of the centre. 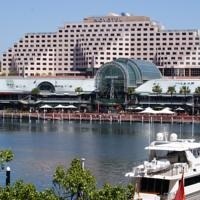 As well as the Marriott, Circular Quay has three other notables, including Pier One Sydney Harbour, alongside the bridge and also part of the Marriott portfolio, which is built on the water with its own private pontoon and spectacular views. The others are the Sir Stamford and Quay West Suites. Big names at Darling Harbour, presently in a frenzy of new-build activity and another highly-popular gathering place, include the spectacular Four Points by Sheraton, Australia's largest hotel (see BTN 9 November 2015), Novotel Sydney Darling Harbour, Ibis, Radisson Hotel and Suites and Park Royal, with the Shangri-La less than a mile away. Restaurants I sampled included Appetito and Zia Pena, both in the Rocks, while City Extra and Fred’s Bar & Bistro on the quay were good places for breakfasts and lunches. And two notes for aviation fans. After Bondi Beach’s lifesaving service was set up, the first life saved was that of a young boy called Charles Kingsford Smith. Mad about flying, he became a pilot and in 1928 made the first trans-Pacific flight from the US to Australia. He later became one of Australia's first airline pilots and Sydney’s international airport is named after him. And Rose Bay, a stop on the sightseeing bus tour, was the site of Australia’s first international airport, from where Qantas 15-passenger seaplanes took off three times a week for the nine-day flight to Southampton. I've just come back from by 4th visit to Sydney. Another great place to visit is Featherdale Wildlife Park.